On June 3, 2017, something happened that changed the climbing world. 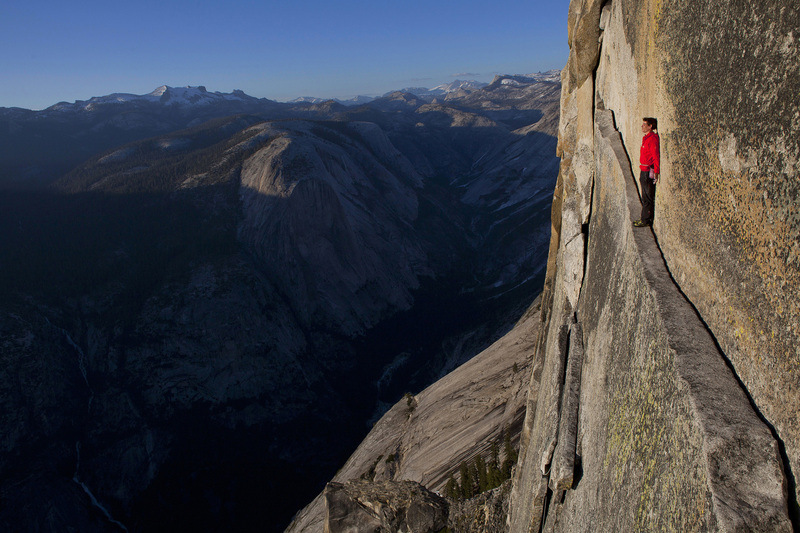 Alex Honnold free soloed Freerider (5.12d, VI, 3000') on Yosemite's El Capitan. This ascent was beyond awe inspiring. Some have said that it was the most impressive thing to happen in any sport...ever. Alex predicted that he would attempt something on El Cap in his inciteful book, Alone on the Wall, which he wrote with the prolific outdoor writer, David Roberts. Indeed, he noted that Freerider would be the obvious choice. 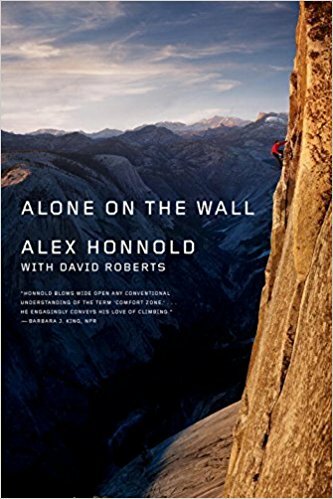 Alone on the Wall chronicles Alex's journey from high school nerdom to internationally renowned rock climber. It looks carefully at how he began free soloing, his mentors, his sponsorship, his films and his most inspirational ascents. It also delves into his psychology and why he climbs without a rope. In Alone on the Wall, we learn that Alex slowly developed his skill over a period of years, going bigger and bigger. When he free soloed Moonlight Buttress (5.12d, V, 1200') in Zion, the climbing world took notice. It didn't take long for him to become a member of the North Face team, traveling the world. It was during his travels that climbing became something more than just a physical pursuit. In the country of Chad, Alex began to think about climate change and sustainability in relation to some of the poorest people on the planet. Shortly after that trip he launched the Honnold Foundation, an organization dedicated to bringing sustainable improvements to developing countries including solar panels and other clean energy innovations. Every once in awhile, I hear that somebody thinks I'm a bad role model for kids. The argument goes something like this: Some kid sees a film like Alone on the Wall and decides he wants to try free soloing. Doesn't have the judgement yet to know how to stay safe. In the worst case scenario, the kid gets on some route right at his limit, loses his cool, and falls off. Well, I challenge those critics to cite a single case in which a climbing accident has been caused by some youngster trying to emulate me. It just doesn't work that way. If you've never free soloed before, you're likely to get twelve feet off the ground, freak out, and back off. Alex on the Thank God Ledge on the Regular NW Face (5.12b, VI) of Half Dome. This is the famous photo from Alex's seminal film, Alone on the Wall. So what about that ascent on El Cap. Alex thought about it for a long time. In his book he even names Freerider as a potential objective for the first free solo of El Cap. But he also notes the pressure. For a while, the media flirted with the idea that Dean Potter and I were rivals to pull off the first free solo of El Cap. I just shrugged off that talk, but it sort of pissed Dean off. "Let's talk about it after it's happened," he told Outside in 2010. "The magazines want a race. But this would be beyond athletic achievement. For me, this would be at the highest level of spirituality." 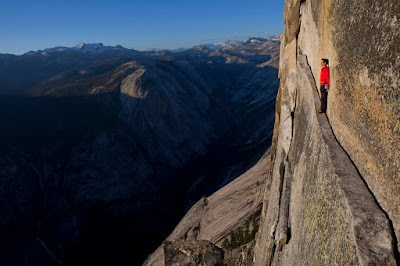 For that matter, even El Cap wouldn't be the ultimate free solo. On Nameless Tower, a huge granite spire in the Trango Towers group of the Karakoram Range in Pakistan, there's a route called Eternal Flame. It's as big as El Cap, and it starts at 17,000 feet above sea level. The route was put up in 1989 by a very strong German foursome, including Wolfgang Gullich and Kurt Albert. After lots of other climbers tried and failed, the Huber brothers, Alex and Thomas, succeeded in climbing it all free in 2009. They rated it at 5.13a. Claiming they were lucky to have good weather and find almost no ice in the cracks, the Hubers called Eternal Flame "the best and most beautiful free climb on the globe." If there's a challenge for the proverbial "next generation," it would be free soloing Eternal Flame. If the first free solo ascent on El Cap was a moon landing, then an ascent of Eternal Flame is a Mars landing. And all that we mere mortals can do is to wish Alex, good luck...!